Machine head were created using the latest 3D-CAD design technology. Bottom feed. Automatic lubrication. Max. sewing speed - 5500 rpm. Max. stitch length - 5mm. ♦ DDL_8700A - For light-weight materials. Max. sewing speed - 4000 rpm. Max. stitch length - 4mm. Needle bar stroke - 35 mm. ♦ DDL_8700H - For heavy-weight materials. Max. sewing speed - 4000 rpm. Max. stitch length - 5mm. Needle bar stroke - 35 mm. Machine head were created using the latest 3D-CAD design technology. 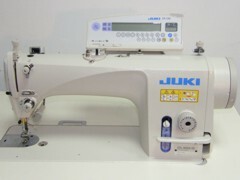 1-needle lockstitch, 2- thread with bottom feed and automatic thread trimming mechanism. Automatic lubrication. ♦ Max. sewing speed - 5500 rpm. ♦ Max. stitch length - 5mm. ♦ Lift of the presser foot - 13mm. Bottom feed. Horizontal-axis double-capacity hook. Automatic lubrication. APPLICABLE: For heavy-weight materials: jeans, leather. Direct-drive, high-speed, lockstitch machine with automatic thread trimmer. Newly developed large machine head. ♦ Direct-drive system (DD system) that offers quick start-up, upgraded stop accuracy, excellent responsiveness, and a stronger needle thrust for faster, better penetration into the material. ♦ Designed without an oil pan, the machine offers improved maintainability with easy removal of dust and lint. ♦ Lift of the presser foot - 15 mm. APPLICABLE: For different types of material. 1-needle, lockstitch machine with edge trimmer. Bottom feed. Automatic lubrication. APPLICABLE: For light- or medium-weight materials: the consistent quality of finished seams. ♦ Distance between the needle and the knife: 2,4; 3,2; 4,0; 4,8; 9,5; mm. 1-needle, bottom-feed, lockstitch machine with vertical edge trimmer and automatic thread trimmer. APPLICABLE: For light-, medium- or heavy-weight materials. 1-needle, bottom- and needle-feed, lockstitch machine. 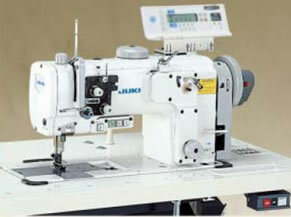 1-needle, bottom- and needle-feed, lockstitch machine with automatic thread trimmer. APPLICABLE: For sewing of outerwear, runstitching of mens shirts, etc. and the attaching of various parts to garment bodies. 1-needle, needle-feed, lockstitch machine with vertical edge trimmer and automatic thread trimmer. APPLICABLE: For light- or medium-weight materials.